K4C, working in partnership with the University of Salford, is launching an appeal to help provide prosthetic hands for a young mother in Fort Portal, Uganda. Ninsiima is a peasant farmer with two small children. Last month her husband brutally attacked her severing both her hands from just above the wrists and one of her ears as she sought to protect her face during the attack. Ninsiima came to our attention as she was about to give birth to a third child. Dr Rosie Townsend, K4C obstetrician volunteer was able to help Ninsimma to give birth safely. 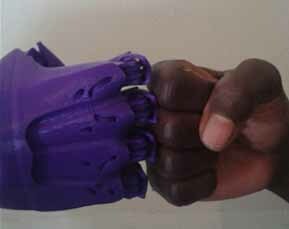 Our bio-medical engineering project headed by Dr Robert Ssekitoleko (K4C volunteer) and involving a group of young pioneering engineers (Ms Christine Nabbanja, Dr Tony Mutanda and Mr Brian Senabulya) have designed and produced (through 3D printing in Uganda) two prosthetic hands. We are now fund raising to raise around £500 for the electronics needed to ensure functionality so that Ninsimma can continue to farm her land and support her children. We are also planning to provide her with an incubator to help her set up her own poultry farming business.